Both sides of our family have a history of traditions in the kitchen. In 2013, Matthew’s mom, Chris, created a cookbook of recipes from her branch of the family. The book includes a heaping of sweet and savory dishes, and amongst all the food is an almost-hidden entry for Cherry Limeade. The drink took about five minutes to make, resembles punch and it rivals the limeades that Sonic Drive-ins sell. Here’s how you make it in about five minutes. Step two: Cut wedges from a lime and cut a slit in each one to fix on the rim of your glasses. Step three: Chill limeade for 30 minutes in the refrigerator. Step four: Pour your limeade and cherries into each glass (with ice, as desired), and serve. Molly’s Take: I’ve always loved lemonades and punch – and what’s better in the warm summers of the South than a delicious, cold, fruity, refreshing beverage? This is perfect for a party or just a simple get-together. The maraschino cherries give it a delightful punch of flavor. 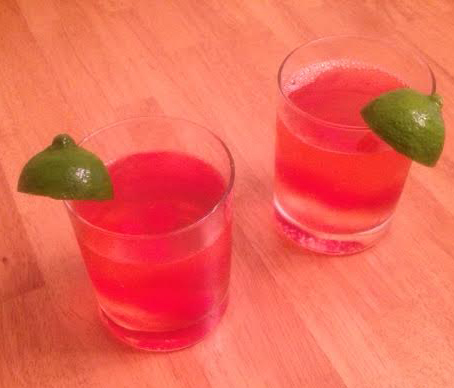 We happened to have lime soda in the fridge, cherries from a dessert we’d made and limes from a dinner we’d made. So it was super easy to put together. But it’s just as easy to pick up those few ingredients. Definitely worth a try! Matthew’s Take: I’m a sucker for a good limeade when I visit Sonic. I’d rather get a limeade than any other drink on the menu. This limeade is as good as Sonic’s, and it reminds me of a punch you’d find at a wedding, birthday or other celebration reception. If you have the ingredients on hand, it really takes about five minutes to prepare, and it’s the kind of fancy-looking drink that would make someone ask what it is as they pass you on your deck or patio. I give this creation an A+ for taste, an A+ for presentation and an A for ease. While the preparation time is amazing, it’s not likely you always have cherries and fresh lime in the kitchen like we did when we decided to make this limeade. Credit: This recipe is credited to Matthew’s cousin, Sherri Blanton.